Attractive plaza areas offer pedestrians an outdoor place to gather and enjoy fresh air, bright sunshine or beautiful views. 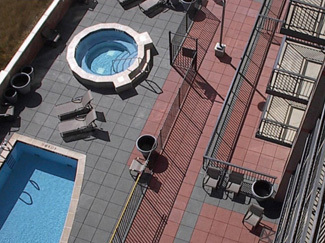 Plazas on rooftops and terraces provide practical solutions for maximizing space and building decks over sloping, difficult or uneven surfaces. At Westile, we understand each building structure has its own unique look and style developed with purpose and passion. We share that passion by helping bring that same uniqueness and style to your plaza area. Whether the plaza design is simple or complex, our mission is to assist the building owner, architect and contractor in producing a smooth plaza surface to achieve the look you want! Westile’s expertise encompasses numerous applications including Universities, Museums, Office Buildings, Hotels, Hospitals, Residential Homes and Condominiums. Plaza Pavers™ are high density concrete pavers that have a minimum compressive strength of 8000 psi. It is suited for use as a plaza deck component providing a durable yet elegant roof surface. Plaza pavers are elevated on high density polypropylene pedestals, which provide uniform spacing, drainage and can achieve a dead level installation if desired. Plaza Paver is manufactured in several locations throughout the USA and Canada, which makes it available and affordable throughout the U.S.
Color samples and finishes are available depending on your region in the country. A complete sample selection is available in the Plaza Paver™ Product section as well as warranty information. Our Literature section contains downloadable product brochures for the Western, Classic and Limerick Plaza Paver Series. And detailed Specifications can be found within the Technical section. The Level System is used for a dead level paver surface. 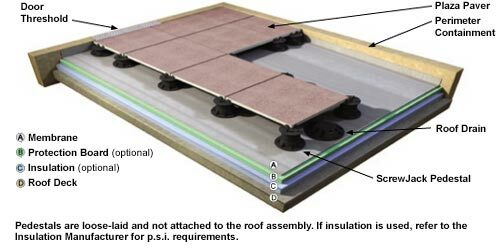 This system allows for installation of a level paver surface over various sloping substrates. The Sloped System can be used when a dead level paver surface is not necessary. LD4 Bottom Leveler Disk offers a simple and cost effective solution to compensating for sloping surfaces between 1/4" to 1" per foot of slope. A single LD4 corrects 1/4"	stack up to four as needed. 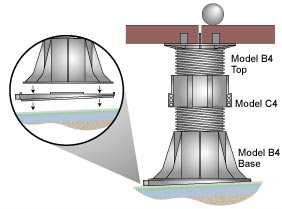 When using two or more LD4’s, rotate in relation to each other to create a plumb ScrewJack and level paver surface. LD4 is not required for slopes under 1/4" per foot.